Urine Collection Tank and Liquid Fertiliser Spreader, for use with Separett waterless, urine separating toilets. Urine Collection Tank and Liquid Fertiliser Spreader*. 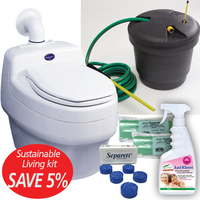 The Ejektortank is an ideal addition to any urine diverting toilet which requires external plumbing for the disposal of urine, such as the Separett Villa or Separett Weekender. The tank holds approx. 50 litres of urine and then mixes it easily and hygienically with water from your garden tap, at a rate of 8 parts water to 1 part urine, for spreading as a garden fertiliser. The mixer function uses the pressure from a water supply to automatically mix water and urine in a special T-shaped device under the top of the tank. It takes approximately 8 litres of water to draw 1 litre of urine from the tank. The resulting mixture is of a suitable strength for watering trees, shrubs and lawns. (Not suitable for food crops.) The visual indicator on the top of the tank will let you know when the tank is full. Current stock: New Stock coming Jan 2017. Contact us to secure your order and avoid disappointment. Requirements: Minimum water pressure of 2.5bar (250kPa) is required to empty the tank.